No, that would have been Agatha Christie’s first draft. She wound up doing much better. I’m the one with the cracked paneling. These panels are original to the house. They didn’t have kiln drying 150 years ago, so there would not have been the problem we face now, dealing with shrinkage for years after we build/trim whatever. Plus, in 150 years you would think the wood would be whatever size it was going to be, kiln dried or not. I think this is happening for a couple of reasons. First, the house is now pretty weathertight. The leaks are few and are being found and sealed. So when it rains, inside the house it doesn’t feel that different. That is the good news. The other news is that for various reasons, when I leave for a few days, the heat goes down but never off. My pipes don’t freeze. Mildew inside and spalling outside are over. But I think the air inside the house must be drier than it has ever been. I’m not sure but that’s all I can figure. Well, no, maybe it’s this. There is no insulation behind the panels. They lie flat against the stone, at least I’m pretty sure they do. So maybe the wood is caught between the consistent dry warmth of the interior and the changeable heat and humidity outside. The contractor says he’ll run around with caulk and touch-up paint to make all this invisible. I don’t know. Even if he actually follows through, cracking panels could be an ongoing phenomenon. It does add character. I liked the character before, though. There are spots where the putty pops out. You can see the infill where 150 years of rising damp rotted the wood. That’s not so nice. Not sure about popping putty but the odd crack adds a little history I think. I know you like things fairly neat and crisp so I guess if it bothers you…? Very odd that these cracks have started appearing now. I have noticed that some of the old wood in our house has “shifted” slightly as if the whole place is settling down after all that major activity. It is odd. I like the theory that this whole process of buttoning things down is in itself causing the cracks. Things probably need a little room to breathe. I can live with the cracks. If the wood actually starts to buckle, then I have a problem. We’ll just have to wait and see. Your house has never been so warm, well insulated or dry, it can’t cope. Seriously, if that panelling is just fixed to the stone walls without an air gap, the temperature thing will be an issue. Well, I believe there is an air gap between the stone and the panels. I believe the panels are fixed along the edges of the panel. So I think it has the cold of the stone on one side and the warmth of the house on the other. Something has to give and it looks like it’s the panels. Before I got here, yes, moisture, mainly in the form of rising damp, was a huge issue. The ground floor panels were rotted to a height of three or four inches which is what, 10 or 15 cm? I’ll figure it out some day. Anyway, they removed the panels and replaced the rotted part with new, matching wood. Then they replaced the panels and painted the whole thing. Now, a couple of months after the heat has been on, the cracks appear. I can live with this level of cracking but I’m afraid it will get worse, that maybe the panels will buckle. I guess you’ll have to wait and see. Crazy isn’t it ? we carefully cherish and nurse these old houses back to life, endlessly stressing the detail, then they pull a stunt like that on you!! Grateful? Ha! I can think of other words for old houses here- grumpy, grudging, gremlin-infested, grindingly slow to complete……..
All true. I might even have been warned. But did I listen? Hahahaha. Yep, no fool like these two late-middle aged fools L & G…. 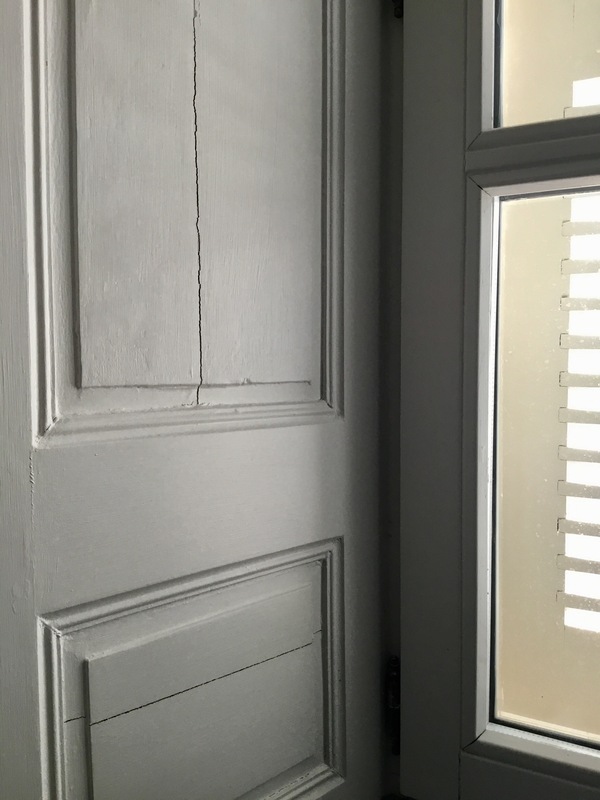 In the last house panels against outside walls cracked when the house was dried out after years of damp. There you go. That’s it. Did this happen just once or was it ongoing? No point in fixing it now if more cracks will appear over time or over and over again. They settled after a year or so, but did not have the rot problem you describe. There could be a dissonance between the state of the original wood and the new stuff which might lead to longer term problems. Yes, I’m worried about that, too. This guy is a woodworker. Like a lot of menuisiers he decided to scale up to entire buildings. Supposedly he works on chateaux. The thing is, every time something like this comes up, it looks like he is seeing it for the first time. My guess is that ordinarily people are so tired of him, they just don’t bother to tell him about this kind of thing. Ah yes…the fabled artisan francais. Bane of my life. Finally a friend suggested a friend of his – a retired menuisier with a stock of old oak. It wasn’t as old as the oak on the original doors, but it was old enough to marry well and we had no problems with it – though to be fair, the main entrance was fairly sheltered from the worst of the weather. Men who work on chateaux…yerss…. Mostly the owners of said don’t know their arse from their elbow when it comes to quality work …unless it is an architect of Batiments de France, in which case I doubt if he knows he has an elbow unless told so when studying for his diploma. The mess our local incumbent made of the buildings under his rule was notorious – but you can’t sack them! More than once I have been told how lucky I am that my house is not quite big enough, not in quite the right neighborhood, etc., so that I have escaped their dominion. I think they just don’t want to bother driving all the way to my neighborhood. Supposedly I am in a conservation area, though you could never tell by looking at the lotissement mess around me. Obviously they never get out here. Sometimes being an hour from everything is a blessing. Those who tell you that are quite right….pains in the the proverbial, most of them, though there are shining exceptions. Interesting. So when the panel was reinstalled, they fixed it so tightly that it can’t expand? That could be. I’m not sure what can be done about that. It makes a lot of sense, though. Thanks! If you change the atmosphere the materials will respond differently. I would bet quite a significant amount that your problem with the panelling is linked to having a weathertight house. What to do about it? Of course the cracks add character in theory but, like wrinkles, it is quite acceptable to not love them. If you want perfect it’ll have to be putty and I am not going to condemn you for that! Actually the cracks are not so bad. Down where they puttied to hide the new wood, the stuff that replaced the rotten parts, that’s not pretty. Anyway, this contractor is big on making promises he doesn’t keep. They will probably stay like that forever. I still have a garden to do. I have a sign which I carry with me everywhere and simply says ‘I’m in the Garden’ … even though I don’t have a garden in this Apartment I find it amusing to have it hung on the door that leads onto the balcony … enjoy doing yours – it will be restorative, I am sure! I bet you’re right about the temp/humidity differential between the stone wall and the house interior. I agree that it just adds character.